Tami, aka T's Zeeler, is a 2½-year-old, dark brindle female born April 24, 2005. Her sire is Rooftop Moby, making her grand sire Molotov, and her dam is RL Nevada, making her grand sire Wigwam Wag. Tami's 46-race career started December 30, 2006, at Dairyland in Wisconsin, and finished December 20, 2007, at Valley Race Park in Harlingen when she suffered a compound fracture of her left 4rd and 5th metatarsal bones. Tami, along with Joe and Skycam, were flown from Harlingen in route to Addison airport on December 22 by GALT adopters and members, Dennis and Didi, but bad weather forced their landing at Georgetown. 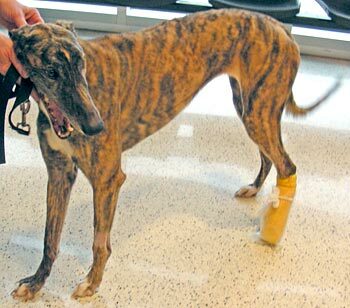 They were driven to Dallas the next day, where Tami and Joe were admitted to the Dallas Veterinary Surgery Center under the care of Dr. Bob Radasch. It was determined the best route for Tami is to repair the compound fracture, keeping the foot immobilized with a splint and cast with bandage changes every 7-10 days. Although Tami does not live with cats, she visited in a home with cats and passed her cat test. She also spent the weekend in a home with a young child (5) and did very well with her. Tami's surgery was performed on December 26. 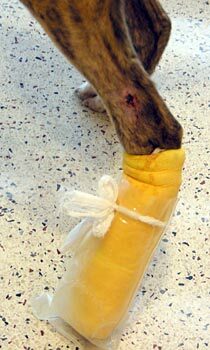 Tami has had complications with sores developing inside the cast next to the fractures. She is being monitored very closely – every 5-7 days maximum – for bandage changes, and is on antibiotics to ward off infection. Tami is a beautiful brindle girl that must have snuck off to Greyhound Etiquette School between races as she has impeccable manners and is completely comfortable and confident in her new surroundings. From the moment Tami entered our home, it was as if she always lived here. Tami is very people oriented. She loves everyone and is always happy. She wags her tail when approached and waits for pets, hugs, and kisses. She gets along fine with all the canines in the house, however doesn't require their presence and is independent. Many times she will leave an occupied room and go to lay down alone on her dog bed or in her crate in the bedroom. Most of the day Tami spends resting quietly on her bed, as if she knows that she has to take it easy and let her leg heal. She is just beginning to play with toys and it is very amusing to watch her discover the textures and sounds of her toys as she pokes at them. She is house trained, crate trained, and very knowledgeable about what is permitted to do around the house. 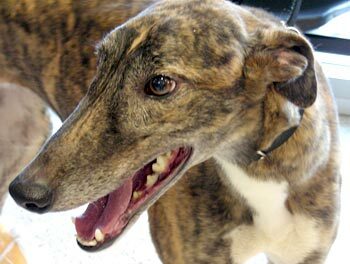 Tami would be a wonderful first time greyhound for new adopters or an addition to a greyhound pack. It is unknown if she is cat/small animal tolerant as Tami has not been tested yet. Tami's bio will be updated as her recovery progresses.